Almost all devices nowadays are touch screen – a gentle tap could make it perform the task indicated by a button. This is convenient for the user but it also makes accidental deletion highly possible, such as your WhatsApp history from your Samsung Galaxy S4. You may not know that the deleted files are actually not gone. They are still in the storage system of your device, but if you keep using your phone, new data will over write the deleted files and they cannot be recovered anymore. So once data are lost, the best thing to do is stop using your phone right away. 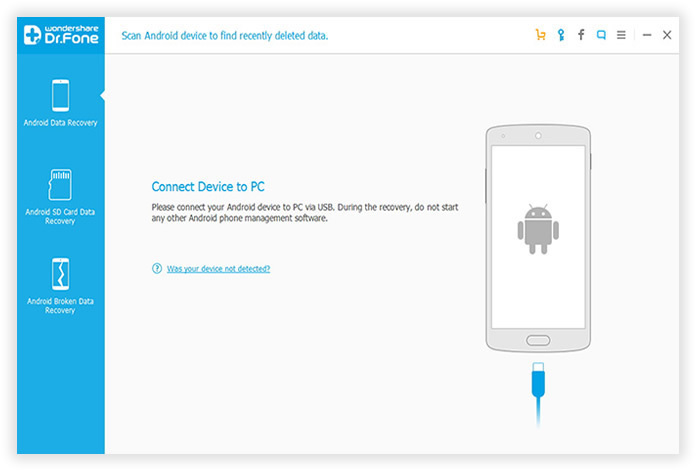 This will make it possible still to recover data that you think were already gone. WhatsApp is used for messaging as well as for sending photos, videos, music, and other files. Once you receive them, you feel confident that you will have them forever. Some people think that these files can be recovered easily but they become frustrated when all their efforts to get them back end up in vain. You can ask the sender for another copy but what if he has deleted his files as well? If the lost file is important to you, the incident could be disastrous. 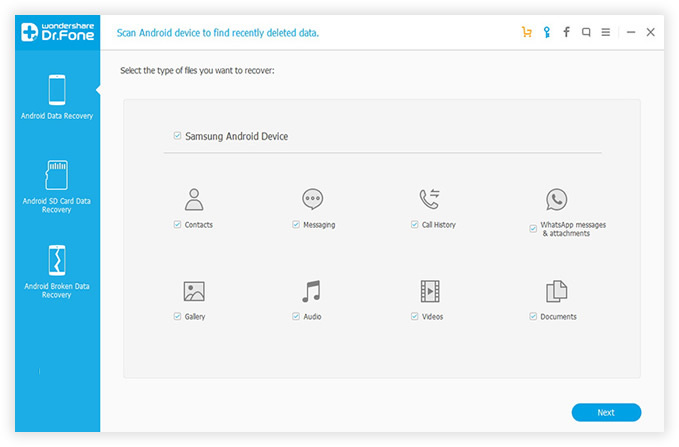 However, there is now professional data recovery software that can help you deleted WhatsApp history from Samsung phone or tablet - Android Data Recovery, you will be able to find again whatever was lost, It can be able to recover everything from Android devices due to accidental deletion, Virus or malware infection, memory corruption or Physical damage. First of all, you should download and install the recovery program on your computer, then plugging your device into the computer via USB cable. Launch program to get into the home window. If this is first time you plug your Samsung device to your computer, then you need to install the right drivers to recognize your Android device. 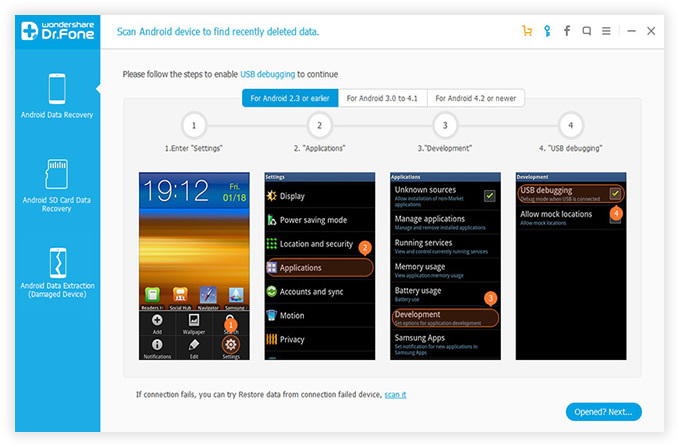 Then enable USB debugging before scanning your Samsung phone. Check it, if you didn't do it, follow the detailed guide below to set it. For Android 4.2 or newer: Go to Settings < About Phone < Tap Build number for several times until getting a note 'You are under developer mod' < Back to Settings < Developer options < Check USB debugging. If you still don't understand, check this article to learn how to enable USB debugging on Android phone. The scanning process may take quite a few minutes. Just relax and enjoy a cup of coffee, when the scan is over, there will be a lot of items found and lists in a well-organized catalogue. Check the "Whatsapp" on the left, all the Whatsapp messages will be shown on the right. 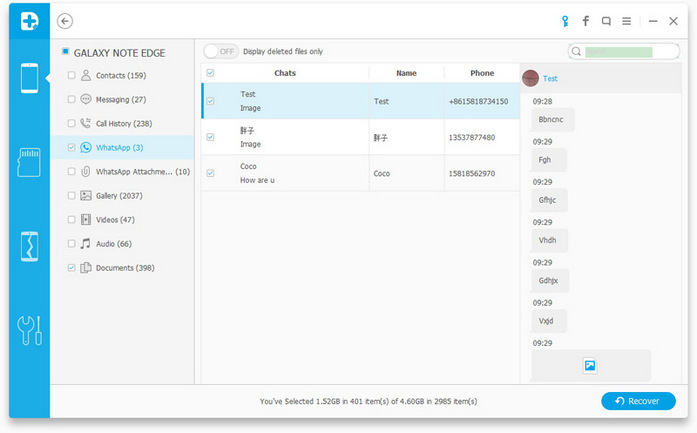 You can preview and select the messages you need to recover. After that click "Recover" button. 1) To reduce the impact of data loss, it is highly recommended to regularly create a backup of your Android phones, many functional Android backup programs can be downloaded and used quit conveniently, like Android backup, Gmail or Samsung Kies and more. 2) When you realize there is something important data need to be recovered, you must stop any activity on your phone, don't save more files or edit data to your phone's SD or internal memory, this will increase the recovery difficulty once the original data was written. Bear in mind. 3) You'd better save the recovered whatsapp Chat History or other data to another drive instead of the phone.